All this week we’ve been bringing you individual hotel reviews from TPG’s recent trip to South Korea, and now it’s time to let you in on all the other fun things he enjoyed while he was there with today’s Destination of the Week: Seoul. Incheon International Airport is the largest airport in Korea and is located about 20 miles outside of Seoul. The airport has its own golf course, ice skating rink, casino, indoor gardens and a even a Museum of Korean Culture. It serves as a hub for Asiana Airlines and Korean Air. When it comes to US carriers, Delta flies there to Detroit and Tokyo-Narita, American is launching service from Dallas on May 10, 2013, United flies non-stop to San Francisco, and Hawaiian Airlines flies to Honolulu. Asiana is a member of the Star Alliance and serves Los Angeles, New York-JFK, Seattle, Chicago O’Hare, Honolulu, and San Francisco. Using US Airways miles, you would need 60,000, 90,000 or 120,000 miles to fly Asiana roundtrip in economy, business or first class respectively. Using United miles, you’d need 65,000, 120,000 or 150,000 miles for economy, business class or first class respectively roundtrip. Korean Air is part of SkyTeam and flies from Seoul to Atlanta, Dallas, Seattle, New York-JFK, Los Angeles, Washington-Dulles , Chicago-O’Hare, Honolulu, Las Vegas and San Francisco. To fly from North America to South Korea, you’d need between 70,000 Skypass miles and 160,000 Skypass miles depending on the class of service. Korean Air is a transfer partner of Ultimate Rewards. To get from the airport to the various hotels, you have several choices. The easiest is probably taking one of the Korean Air limo buses directly outside the international terminal. There are several different routes, but the ticket seller will tell you which to get on when you pay the 15,000 South Korean Won ($13) fare, and they stop at about two dozen of the city’s major hotels. You can take a taxi, but fares range from about 40,000 Won to 100,000 Won, so you’re paying a premium. There is also an Airport Railroad called AREX that connects Incheon to the city’s other airport, Gimpo, from which you can catch the subway to anywhere in the city. Getting around the city is cheap and easy. Taxis are inexpensive, though the “executive” ones which are black tend to cost more. The good news is, almost all accept credit card payment, so you can be earning those valuable points while seeing the city. The subway is also very extensive and easy to navigate, with lines running to the far reaches of the city and crisscrossing its busiest neighborhoods. Fares start at 900 Won (70 cents) and go higher depending on how far you’re traveling. For a quick way to see all the main sights, grab a one-day pass aboard the Seoul City Tour Bus starting at 15,000 Won ($13 USD). It’s a hop-on hop-off service that will take you to many of the places mentioned below. Start your visit in the north of the city, in Jongno, one of its oldest neighborhoods where you’ll find Gyeongbokgung Palace, the former royal palace of the Joseon dynasty, whose gates are guarded by men in period costume. 3,000 Won ($2.50) will get you entrance to the sprawling grounds which include reconstructed buildings, parklands with lakes and pavilions and two museums: the National Folk Museum of Korea with a pagoda perched on top of it, and the National Palace Museum, which looks back on royal life in Korea with historical artifacts garnered from Seoul’s palaces. A couple blocks west of the palace, you’ll find one of Seoul’s best-known restaurants, ToSokChon, where everyone orders the house specialty: ginseng chicken soup. It can get touristy, but the food is tasty and cheap and plenty of local Koreans eat there too. On the western side of the palace runs Samcheongdong-gil, a lively street filled with art galleries, shops, restaurants and cafes that you can spend a whole afternoon wandering – be sure to slip down some of side alleys where some of the more interesting shops are. Not far from here, the city’s other palace complex, Changgyeong Palace and Changdeokgung, which was originally built in the 15th century to house the ladies of the royal court including dowager queens and concubines. The grounds here are spectacular, as are the lovingly reconstructed buildings, though the main draw is the Biwon “Secret Garden,” which you must visit on a guided tour (English ones at 10:30 am and 2:30 pm). Save some money by getting a 10,000 Won combination ticket to all three palaces plus another galled Deoksugung and the Jongmyo royal shrine nearby. After your palace tour, venture a few blocks to the southeast to stroll along Insadong, a shopping street with everything from cheap souvenirs and tantalizing street food to high-end porcelain and little clothing boutiques. For a relaxing walk, you can also hit Cheongyecheon, a stream that runs through the heart of the city and that has been turned into a walking a jogging trail, often with special exhibits and installations including the current autumn lantern festival, which is illuminated in the evening and draws huge crowds. 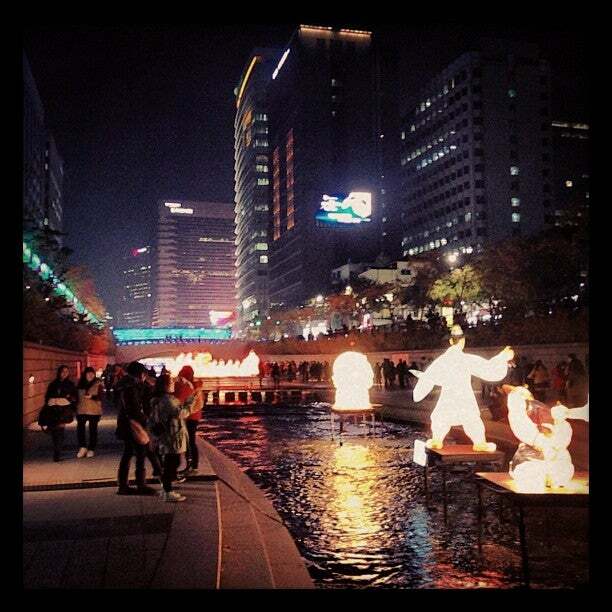 The annual Lantern Festival along Cheongyecheon. If you get a clear day on your visit, head to the top of Namsan Park, a beautiful hilly forest in the heart of the city, and to the top of the N Seoul Tower for commanding views of the city and beyond. To get up here, you can catch a bus from the Chungmuro subway station, or a tram from near the Myeongdong station that costs 6,300 Won ($5.75) roundtrip. Seoul is also a shopper’s paradise. To find all the name brands, head to the high-end Hyundai Department store in Gangnam. It’s a multi-story emporium of designer fashions, cosmetics and home goods. The Shinsegae and Lotte Department stores are other popular choices for a full-on shopping spree. Also in Gangnam, Cheongdam-dong, also known as “Rodeo Street,” is where many of the designers have their flagship stores and you’ll find brands such as Prada and Cartier here. Another option if you’re staying on the north side of the river is to head to the monolithic Shilla Hotel, one of the city’s best-known deluxe properties, which also has a huge Duty Free department store on the grounds that is usually teeming with tour buses. Farther west in Gangnam is trendy Garuso-gil, a street populated with one-off boutiques from hip, young, local designers, as well as cute cafes and restaurants. Then for a real bit of Korean culture, hit the night markets of Namdaemun just north of Namsan Park. One of the most fascinating opportunities to take advantage of when visiting Seoul is the chance to visit the Demilitarized Zone that spans the border between South and North Korea just about an hour north of the city by car or bus. There are several companies that run tours here, though the most recommended by far is the USO-sanctioned Koridoor Tours. We were only able to take the tour that visits the Dorasan Station, the third infiltration tunnel and the Dora Observatory, but their flagship tour is the one that visits the Joint Security Area (Panmumjeon) where the talks to end the Korean War were held, and where representatives of the North and South can meet. Tours range from between about 40,000-100,000 Won ($36-90) and can take between 4-10 hours depending on how extensive your itinerary is. Korean cuisine is fast becoming one of the world’s top foodie trends as well, so try out some classic dishes at restaurants like the popular Gae Hwa Oak including salted pork belly with kimchi, and good old Korean bbq at Min-sok-chon, a spot in Gangnam that’s popular with both natives and expats alike. Noryangjin Seafood Market is another popular destination where visitors can get a feel for the local fish markets and peruse the catch of the day. Bathing and spa culture is another big part of Korean life, and the most popular choice for visitors by far is the upscale but low-key Dragon Hill Spa in Yongsan, where guests can spend an afternoon wandering among saunas, steam rooms, heated pools, a fitness center and the salt room. Bright and airy king guest room at the Millennium Seoul Hilton. 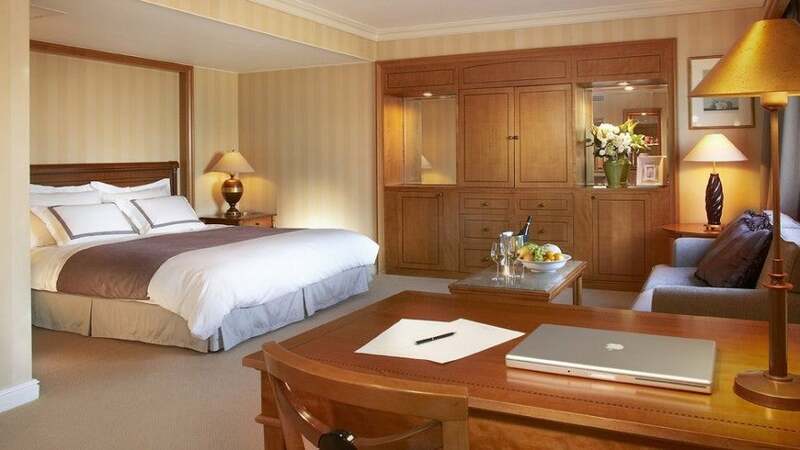 Millennium Seoul Hilton: Located at the foot of Mount Namsan, this property is 1.5 miles from Seoul’s business district. The bright and airy guest rooms are decorated in rich warm tones and feature 42-inch plasma TV’s and wireless internet access. There are also Executive rooms with access to the Executive Lounge serving complimentary breakfast, hors d’oeuvres and refreshments. The hotel has a fitness center, indoor pool, whirlpool and spa. The property has eight restaurants and a bar for guests to choose from. They offer French cuisine at Seasons, Italian favorites at Il Ponte, Japanese dishes at Genji and Chinese specialties at Taipan, to name a few. Rates in November begin at 235,000 KRW ($215) or 35,000 Hilton HHonors points since it’s a Category 5 property. Other Hilton properties include the Grand Hilton Seoul, which is located 15 minutes from downtown. Rates in November begin at 230,000 KRW ($210) or 35,000 Hilton HHonors points since it’s a Category 5 property. 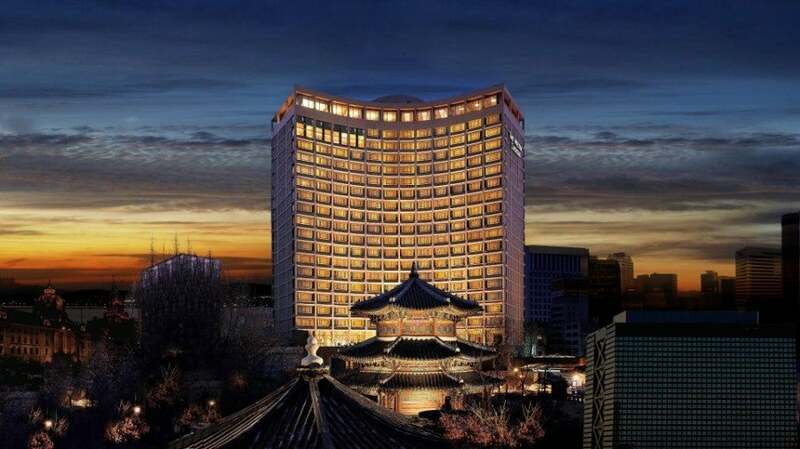 There is also the Conrad Seoul which is located in the heart of Yeouido Business District. Rates in November begin at 280,000 KRW ($260) or 50,000 Hilton HHonors points since it’s a Category 7 property. One of the Club Lounge’s sitting areas at the Grand Hyatt Seoul. 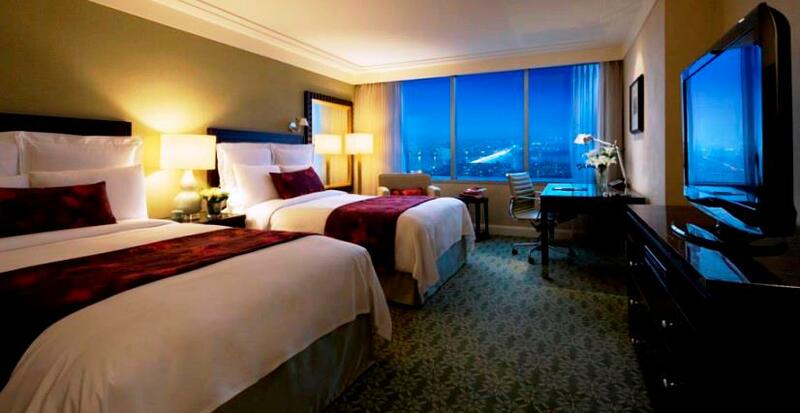 Grand Hyatt Seoul: Located in the Yongsan district, this property has 601 guest rooms and suites. You can read the full review from this week on this property. Rates in November begin at 275,00 KRW ($250) per night. This is a Category 4 hotel, so free night redemptions require 15,000 Gold Passport points for standard rooms and 23,000 for suites.This hotel is also part of the American Express Fine Hotels and Resorts and the Visa Signature Hotels collection. Exterior of the Park Hyatt Seoul. 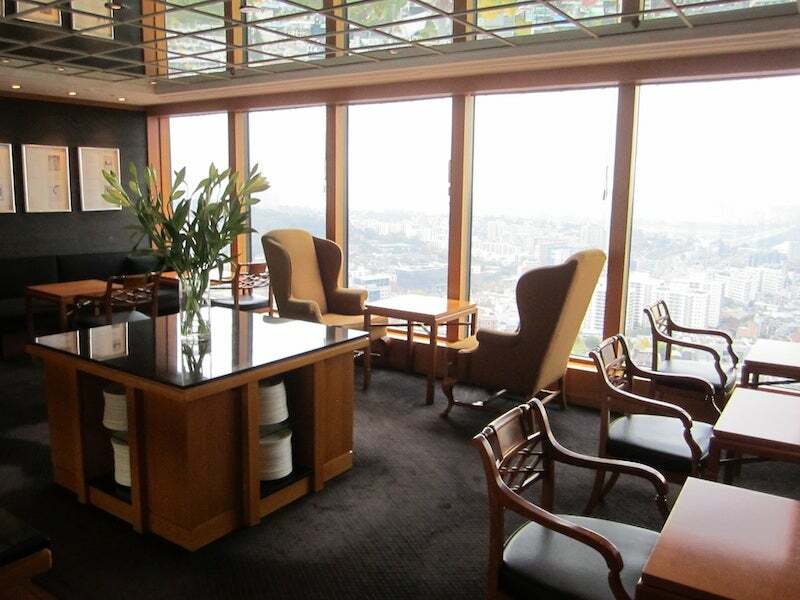 Park Hyatt Seoul: You can also view TPG’s full hotel review on this property. Rates in November begin at 370,000 KRW ($340) per night. This is a Category 4 hotel, so free night redemptions require 15,000 Gold Passport points for standard rooms and 23,000 for suites. This hotel is also part of the American Express Fine Hotels and Resorts collection. Double guest room at the JW Marriott Hotel Seoul. 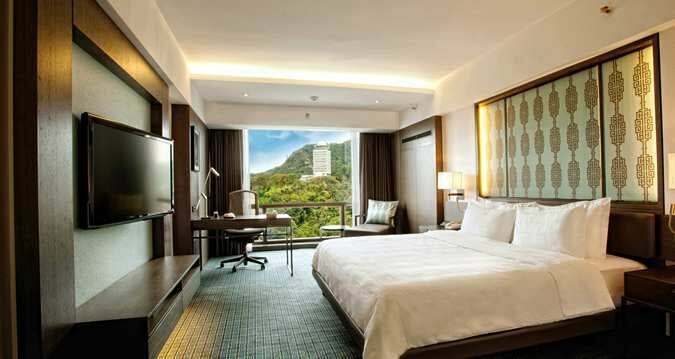 JW Marriott Hotel Seoul: Located within the central city, this Marriott property features 497 rooms and suites with river or mountain views. The hotel has an Executive Lounge which serves complimentary continental breakfast, afternoon tea, hors d’oeuvres, dessert, and non-alcoholic beverages. There is also the Marquis Thermal Spa and Fitness Club with lap pool and rock climbing wall. There are many options for dining at the property including American cuisine at JW’s Grill, Japanese choices at Mikado, Chinese dishes at Man Ho, or Italian cuisine at Olivo. Rates in November start at 254,000 KRW ($235). This is a Marriott Category 6 property, and requires 30,000 Marriott Rewards Points (25,000 with PointSavers) for a free night redemption. Other Marriott properties in Seoul include the Renaissance Seoul Hotel, where rates in November start at 268,000 KRW ($245). This is a Marriott Category 5 property and requires 25,000 Marriott Rewards Points (20,000 with PointSavers) for a free night redemption. There is also the Courtyard Seoul Times Square. Rates in November start at 175,000 KRW ($160). This is a Marriott Category 4 property, and requires 20,000 Marriott Rewards Points (15,000 with PointSavers) for a free-night redemption. Exterior view of the InterContinental Grand Seoul Parnas. 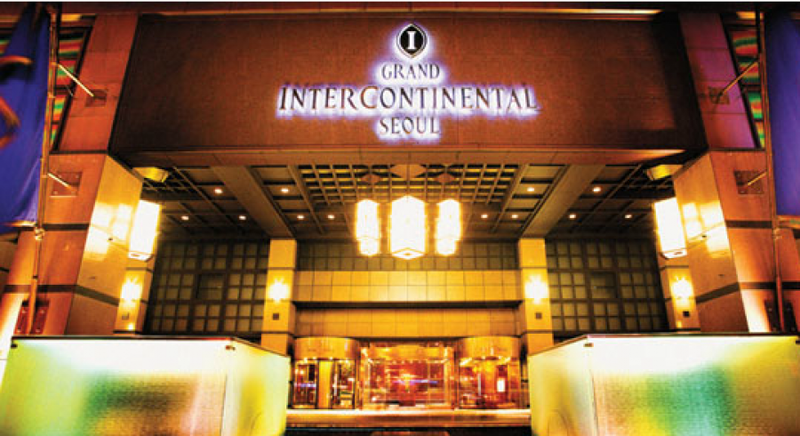 InterContinental Grand Seoul Parnas: This property has 518 modern guest rooms and suites. Also housed in the hotel is the Metropolitan Fitness Club with has an indoor swimming pool, golf driving range, massage services, saunas, Jacuzzi, steam room and aerobics studio. The hotel has nine restaurants including C Grill specializing in steak and seafood, Hakone for intricate Japanese, Pulhyanggi for Buddhist vegetarian, or Table 34 which has a 3,000-bottle wine list and European-inspired dishes. Rates in November start at 236,000 KRW ($215) or 40,000 Priority Club points. This is a member of the Visa Signature Hotels collection. There is also the InterContinental Seoul Coex which is only a few blocks away at the convention center. Rates in November start at 229,000 KRW ($210) or 40,000 Priority Club points. There is also the Holiday Inn Seongbuk, which is located in a residential area about 10 minutes by metro from downtown Seoul. Rates in November begin at 125,000 KRW ($115) per night or 15,000 Priority Club points. Exterior view of the Westin Chosun. Westin Chosun, Seoul: Located in downtown Seoul, this property boasts 462 guest rooms, including 40 suites. Club level guests and SPG Platinum members have access to the hotel’s Executive Club Lounge which serves complimentary breakfast, afternoon tea, cocktail hours, refreshments, and snacks. Guest rooms are equipped with Nespresso coffee machines, LCD flat screen TV’s, Westin’s Heavenly Bed, and Heavenly Bath which includes a separate shower and bathtub. The property features WestinWorkout facilities as well as a indoor swimming pool, whirlpools, steam and dry saunas, and an ice fountain machine. Dining options include The Ninth Gate Grille, Hong Yuan and Aria. Rates in November begin at 250,000 KRW ($229) per night or 12,000 SPG points as this is a Category 5 property. You can read the full review from yesterday here. 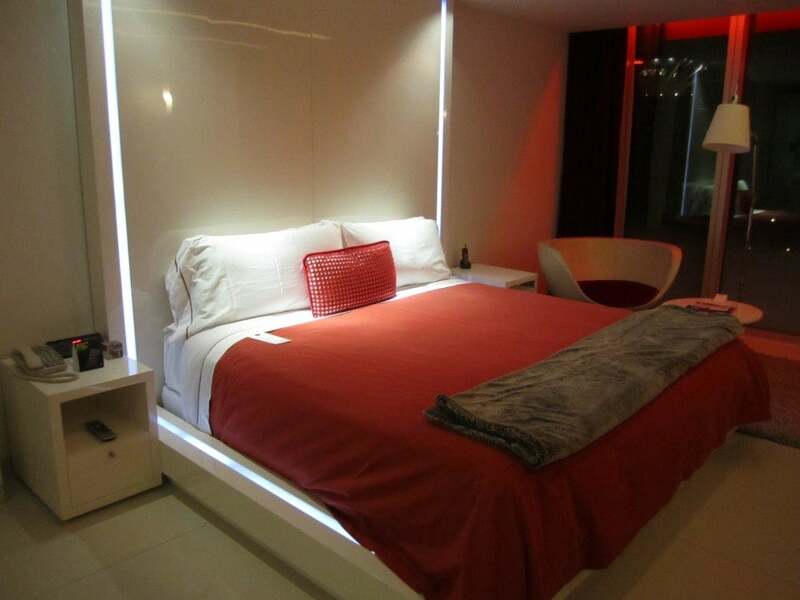 Guest room had a king bed with a red coverlet at the W Seoul. W Seoul-Walkerhill: TPG Managing Editor Eric stayed here last week and you can read the full review from earlier this week on this property. Rates in November begin at 265,000 KRW ($245) per night or 12,000 SPG points as this is a Category 5 property. This is also part of the Visa Signature collection. Other Starwood properties include the Sheraton Grande Walkerhill, which is located right next door to the W. Rates in November begin at 216,000 KRW ($198) per night or 10,000 SPG points as this is a Category 4 property. There is also the 269-room Sheraton Seoul D Cube City Hotel where rates in November begin at 225,000 KRW ($206) per night or 10,000 SPG points as this is a Category 4 property. King guest room at the Ritz-Carlton Seoul. Ritz-Carlton Seoul: Located in Korea’s economic heart, this hotel has 375 guest rooms, including 47 suites and 75 club level rooms. Guest rooms have private balconies, luxurious linens, flat-screen TV’s and wireless internet access. Club level guests have access to the club lounge which serves five complimentary food and beverage presentations including breakfast, light snacks, hors d’oeuvres and desserts and traditional afternoon tea service. The hotel has four restaurants, a lounge and bar and a deli. There is a fitness center, indoor swimming pool, sauna, steam, and hot & cold baths. Rates in November begin at 310,000 KRW ($285) per night. This property is a Tier 1 property in The Ritz-Carlton Rewards, so it requires 30,000 points per night. When cardholders use a Visa Signature credit card to book a room through the Visa Signature Hotels program, they are eligible to receive extra perks such as discounted room rates, room upgrades, free breakfast, early check-in and late check-out, dining and spa credits and more. Visa Signature cards include the Chase Sapphire Preferred, Chase Sapphire, British Airways Visa Signature Card, the Hyatt card, the Marriott Rewards Premier Credit Card and Marriott Rewards cards, the Southwest Rapid Rewards Plus card, Bank of America’s Alaska Airlines Visa Signature credit card and Hawaiian Airlines cards, Capital One Venture Rewards Credit Card, US Bank FlexPerks, Citi AAdvantage Visa Signature, and many more, so chances are you’re carrying at least one of them in your wallet. King guest room at the Shilla Seoul. The Shilla Seoul: Situated on 23 acres of parkland, this 511-room hotel is located in the heart of Seoul. Guest rooms offer city or mountain views and have modern amenities such flatscreen TV’s and complimentary wireless internet access. This hotel offers many acclaimed restaurants featuring Chinese, Japanese, and French cuisines. Guests have use of both the outdoor swimming pool and Jacuzzi, as well as an indoor pool. There is also an expansive fitness center, indoor golf range, and luxurious Guerlain Spa. Rates in November start at 260,000 KRW ($238) per night. This hotel is also part of the American Express Fine Hotels and Resorts collection. Photo credits: Jareed/Flickr; Changgyeong Palace/Wikipedia; Cheonggyecheon/Wikipedia and Flickr.